Here we go again. 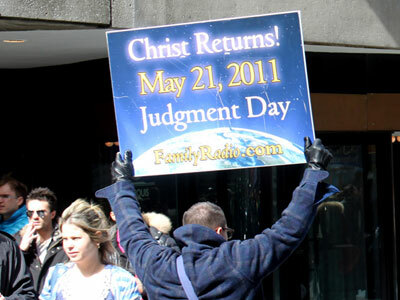 Trending this month is that the world will end on May 21, 2011 and that Christ will return. These persons reason that the seven days are 7000 years. And, since the flood – they say – occurred in the year 4990 BC, seven thousand years later places the end of the world as occurring in the year 2011. The second proof – according to these persons – is the number of days between the crucifixion of Christ and May 21, 2011. There are 722,500 days between them. These persons reason that the 722,500 number is significant because it is composed of the numbers 5x10x17x5x10x17. Five, according to them, five signifies redemption; ten signifies completion; and 17 signifies heaven. That the number five represents the month; the number ten represents the Christian Era (2011); and the number 17 the day Christ ascended to heaven. The numbers are doubled for significance. Does any of this hold Scriptural weight? So Jesus tells us concerning any knowing of such dates as belong only in the jurisdiction of the Father. That even he himself nor the angels knew. So how is it that men can know something Jesus himself said that he did not know? The call is to “keep on the watch” because no human knows when Jesus will return. It is for who not to know? Men! The Father in heaven is the only one who knows. Are men claiming they know something that only God knows? Yet, these people are saying May 21, 2011. Who should one listen to? Another problem is that they put all together the The End of the World, Christs Return, Judgment Day, and The Apocalypse. This shows a woeful ignorance of Scripture. The Scriptures do not show these events as running together or being the same. For example, Revelation 20:6 shows Jesus as having a 1000 year rule over (kingdom) over the earth. So how can his return, be the end? What has gone terribly wrong? The religious system men named Christianity stands alone and apart from Christ. It has it’s own agenda and proceeds along with that agenda not giving a listening ear to Christs teachings. It has created the unholy teachings of The Trinity, Hellfire, Rapture, the establishments of dates such as May 2011, September 2012, November 1914 and others when Jesus said it is not for humans to know such things; that we are simply to keep on the watch. What is being imitated here by those making the claim that May 21, 2011 is the end of the world, is the example of the Evil Slave in Jesus’ parable at Matthew 24:48-51. Jesus speaks of two types of slaves within his household: Evil unfaithful slaves and a faithful slaves. It was the evil slaves who where expecting the Master to arrive at a certain time because they were the ones who felt that he was delaying in his return. The faithful slaves were not expecting the Master to return on a certain date, but remembered what the Master told them: that he would return for them. The faithful slaves were simply in expectation of their Master’s arrival not knowing when it would be. They were simply “keeping on the watch” for him. But no so for the evil unfaithful slaves. The evil slaves felt their Master was delaying (implying they were expecting him at a certain time), so they begin to beat their fellow faithful slaves. This is what is occurring now among persons and religious organizations who affix dates to events in Scripture that Jesus says only the Father knows. One would be wise not to get carried away by all of this. The end times spoken of in Scripture are many hundreds of years in front of us and many events have to occur prior to that time. Christianity has led (misled) the entire world down a path that leads to dysfunction, rather than sobriety and clear thinking. It is not listening to Christ and his teachings. When May 21, 2011 comes and goes without event, these people will look foolish and disreputable. Not only that, they will make Scripture and Christs teachings within it look foolish as well. They will have done more harm than good. They will, no doubt, admit to some miscalculation or mistake. Sadly, many will still go along with them. They want to occur those things that they created such as The Rapture. Jesus never spoke of such a thing explicitly or implicitly. But they are not listening to him. They move ahead aggressively with their own agenda establishing dates and such because they want so badly to believe that what they believe is true. These are outright lies and errors on their part and will never happen. That they have placed a date on Christs return and the end of the world, despite what Jesus says at Matthew 24:36, Mark 13:32, Matthew 24:42 and Acts 1:7, shows that they have no real interest in listening to Jesus. They are actually in opposition (or anti) to what Christ has stated. So blinded they have become by the system that bred them (Christianity), they they do not see this opposition to Christ in themselves. They listen to a “system” called Christianity that generated and created these false teachings and they operate within that system and will defend it as legitimate. Slick talking men and women draw the weak-minded and desperate to themselves and speak of the world coming to the end according to themselves and not according to what Christ says in the matter. I look forward to what these persons will say after May 21, 2011 comes and goes without event. Previous ArticleIs 2012 The End of the World? Do I hear silence? Where these persons who were so certain that Christ would return on May 21, 2012? Jesus had already said that it is not possible for human or angel to know this. That even he did not know. Yet, people will continue on with this “non listening to Christ” posture and continue with this foolishness. Why? Because they are listening to other humans and religious organizations rather than listening to the one The Most High God said we are to listen to, His Son. (Luke 9:35). And, what does the Son say? Know one but the Father can know this.